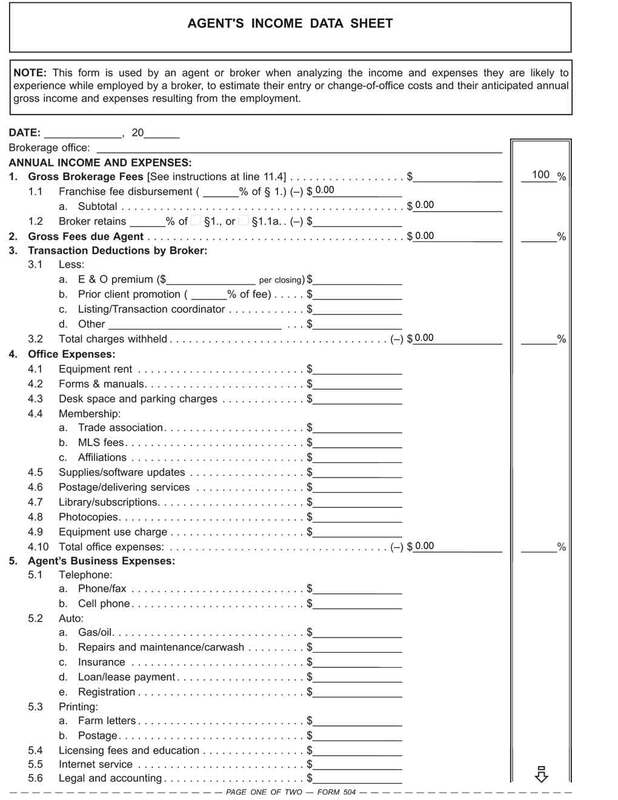 This form is used by an agent or broker when analyzing the income and expenses they are likely to experience while employed by a broker, to estimate their entry or change-of-office costs and their anticipated annual gross income and expenses resulting from the employment. As a broker operating an office employing sales agents and broker-associates, your success depends in large part on the quality of the individuals you employ. The path you take to recruit agents you employ in your brokerage office depends on your business model. Some brokers hire as many agents as they can squeeze into cubbies in their office. For them, it is a numbers game for blanketing the real estate markets, an MO sometime called a media broker. Others recruit only those agents and broker-associates with track records that exceed typical production standards. Still others focus on a niche market employing only licensees who practice in that sector. But before you create a plan for hiring agents/broker-associates, your recruiting goal needs to be set. Only then can you plan just where you are going to find talent — and how you will solicit it. how much time and staff you will commit to training and supervising these agents. These different types of prospective hires have varying needs and skill levels. Thus, the time you are willing to commit to necessary training and supervision may well determine who you will focus your recruiting efforts on. Once you’ve located potential hires, they need to be vetted to gauge their individual potential. Before calling for an interview, fundamental information about the prospect is gathered to determine whether a face-to-face interview is merited. when the prospect will be available to start work for you. Ask questions that will help you determine whether their characteristics are in line with the objectives you have set for the type of agent or broker-associate you seek to hire. Specifically, ask why they think they will be a good fit in your real estate brokerage operation. The discussion allows both you and your prospective hire to make an informed decision about whether they will thrive at your brokerage. After a prospect has been pre-screened using the Agent Interview Sheet and a formal interview has been conducted, you and the prospect then need to establish the sales goals to be met for the first year of employment. Potential hires often have unrealistic expectations about their production and earnings as an agent with a brokerage firm. A written presentation of expectations enables them to have a clearer insight into what income to anticipate when representing your company. This high degree of personalized data bonds the prospect to you — incentivizing them to hire on with your brokerage versus seeking employment elsewhere. A potential hire needs to understand what their anticipated annual gross earning, expenses and net income will likely be during their first year as an agent employed under your license. Without an upfront analysis, an agent will only be guesstimating the annual net earnings they will likely earn with your brokerage. You, as the broker, are best able to anticipate the income and expenses a potential hire will incur. It is the broker — not the prospect — who is best able to draw a conclusion about a prospect’s future with your office. Your primary objective when hiring an agent is to increase the gross broker fees received by the office without a disproportionate increase in operating expenses. Your full disclosure — upfront and prior to employment — about a prospect’s likely income and expenses leads to realistic expectations of income for both you and the prospect, arrived at mutually. Once the operating expenses, nonrecurring costs and carrying costs to be incurred have been established — based on your history with other similar agents you employ — there remains the difficult task of anticipating a potential hire’s gross fees from sales that will most likely close during the first year of employment. A new hire will not alone be able to accurately estimate the gross fees they will initially generate in your brokerage. Here, your first-hand experience is necessary. A couple of approaches for estimating future fees are apparent. For one, you may project a range of gross broker fee amounts, varying from the earnings generated by a high producer to those of a low producer during their first year with the office. Until the potential hire has been on the job working as an agent for you, you will not know at what level they can produce income. However, you can give the prospect a range of income earned from that of the weaker to that of stronger producers. A newly licensed agent can also independently use the data sheet for similar analytical and financial-planning purposes. Before they look for an employing broker, they really need to set their own goal for the annual income they want to earn. The volume of real estate sales they close during their first year in the business is essentially a “numbers game.” New agents will soon discover that only a fraction of all sales efforts come to fruition in the form of fees received from closings. Thus, to be successful, agents need an innate curiosity and the enthusiasm for estimating and forecasting income and expenses. When an agent becomes discouraged or daunted by the exercise of completing the worksheet, they are not a prime candidate for employment in your office. Setting realistic goals is the result of forethought and analysis with the addition of first-hand input from you — the broker who may employ them. Goals are known, quantifiable personal objectives. They are not to be left to somehow evolve after an agent starts work. Once set, goals are what an agent expects of themselves, and of you. What is the dollarrange of the sales (leases and mortgages) I will work with? How many sales (leases or mortgages)will I likely close in my first year? What cash reserveswill I need before my first transactions close? What business equipmentand supplies will I need to provide? Is the model of my carsufficient for showing properties? Armed with the data on the worksheet, an agent is able to intelligently renegotiate fee splits and the allocation of expenses with their present employing broker, or competitively shop for another broker. 1. Gross brokerage fees: Enter the dollar amount of the fees it is estimated the broker will receive and share with the agent. 4.10 Total office expenses: Enter the total dollar amount of all the amounts entered in sections 4.1 through 4.9. Editor’s note — These office expenses will be incurred because the agent maintains a properly equipped office from which he can conduct business, maintain files and perform the clerical work required to service his clients’ needs.